Freddy has problems. Some of them are because he's autistic. Most of them are because he's a teenager. When he’s seven years old, Freddy's mother walks him to the train station, sits him on a bench, kisses his forehead, and disappears from his life. In a few short days, everything changes. His father moves him across town, enrols him in a different school, and takes him away from little Saskia, the only friend he’s ever had. As they reconnect, Freddy begins to remember what really happened ten years ago. And everything he thought he knew begins to unravel. Both humorous and heartbreaking, Do You Think This Is Strange? is a coming-of-age tale you won’t soon forget. Everything was irrelevant except that I didn’t fit in, had never fit in, and it would be best if I didn’t fit in somewhere else. Recently, Lisa Genova introduced me to another kind of diverse literature; a literature in which people’s perception of the world differs from the majority of us due to their condition: Still Alice‘s protagonist suffers from an early onset of Alzheimer, while Love Anthony is about a mother grieving an autistic son. Aaron Cully Drake might be our Canadian equivalent of Lisa Genova. 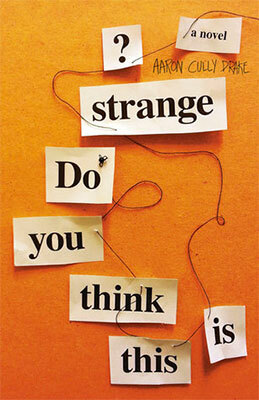 His debut novel Do You Think This Is Strange? is a riveting novel narrated by a highly functional autistic seventeen-years old. The author, whose daughter has autism, managed to create an accessible and lovable character, opening the reader’s mind to a condition very little understood amongst the public. Do You Think This Is Strange?‘s main character is Frederick Wyland—called Freddy—a high schooler who carries a tragic, heartbreaking memory: when he was 7, his mother left him at the train station and disappeared. In Freddy’s mind, the traumatic event has been a blur for years but when he is unexpectedly reunited with Saskia, one of his few childhood friends, memories slowly come back. First thing I loved in Do You Think This is Strange? was how Freddy was a strong, proud character. People with autism are often depicted as impaired, dysfunctional individuals even though the spectrum is extremely wide. Yet, Freddy won’t let you pity him. He is a sensitive, intelligent young man with a strong personality and sense of justice. His autism isn’t really a problem: neurotypicals’ narrow minds are. They ask ambiguous questions; how can they expect specific answers? They insist on having conversations; what’s the use of “small talk”? They misinterpret situations they know nothing about and constantly need to label people. They behave irrationally. They even use words that are supposed to express the exact opposite of what they mean: often, his father sourly states “That’s just great!” for instance. I loved how the roles were reversed, how Aaron Cully Drake demonstrated the logic behind Freddy’s behaviour, and how neurotypicals were the ones who looked strange in this novel. Saskia Stiles was my new Favourite Thing because, when she was around, my least favourite thing—other people—stayed away. She was a human antidote. Also, Freddy’s very slow bonding with Saskia was also spectacularly well written. In a world where everything happens so fast, in which people hate “wasting their time”, where everything is standardized and formatted, Freddy and Saskia’s interactions were as moving as humorous. They take tiny, shy but heroic steps toward each other and each effort is so much more meaningful considering how hard it is for them. The story of Freddy and Saskia shows that the seemingly impossible can happen, provided you give everyone the space and time they need. It also raises question about what communication and friendship are. With Saskia at my table, there was no need to concentrate on mundane banter. There was no need to try to anticipate questions, or analyze comments for non-literal meanings. So I relaxed and became the person I wanted to be. Saskia and I sat in our two solitudes, together enough that we could let each other be safely alone. Then there was the stage where we stopped pretending that some things were getting better. Because some things weren’t. That’s the stage where we knew it would be like this forever. (…) And when you realize something like that, your world collapses like a mud hut. It drops down on you, and there’s no more lying about it. Your son has autism. He has it and he’ll have it the rest of his life. I saw Do You Think This Is Strange? called a “teen romance” somewhere. It felt extremely reductive to me. Yes, the book features teenagers; yes, it does feature love; but the book is much more than this, I believe. It questions the concept of normality and relationship; it raises awareness about people with autism; it does, hopefully, trigger interest and understanding towards people who behave differently than the majority. To put it simply, Do You Think This Is Strange? is a very human book that everyone should read. I also gave this book 5 stars, and I’m happy to see other people reading it. 🙂 It blew me away – I was not expecting it to be so good. I love what you said about the role reversals. I think that is one of the reasons I loved it so much. Great review! Hello Naomi, it’s actually your blog review of the book that convinced me to read it! Gahhh! Both you and Naomi loved this book. I really must read it. Lovely review. Thanks for sharing.